One theme I’ll never get tired of chronicling is a new watch commemorating an occasion in someone’s life. This was the case 22 years ago when Bill chose a Two-Tone Rolex Submariner to mark earning his MBA. Anchoring the tug toward buying a Submariner were two of his friends: one had a Stainless-Steel version, the other a Two-Tone. While his buddies undoubtedly influenced his choice at the time, his affinity for watches was kindled by his father. To this day he fondly recalls his Dad wearing a Seiko, Omega, and a Rado. 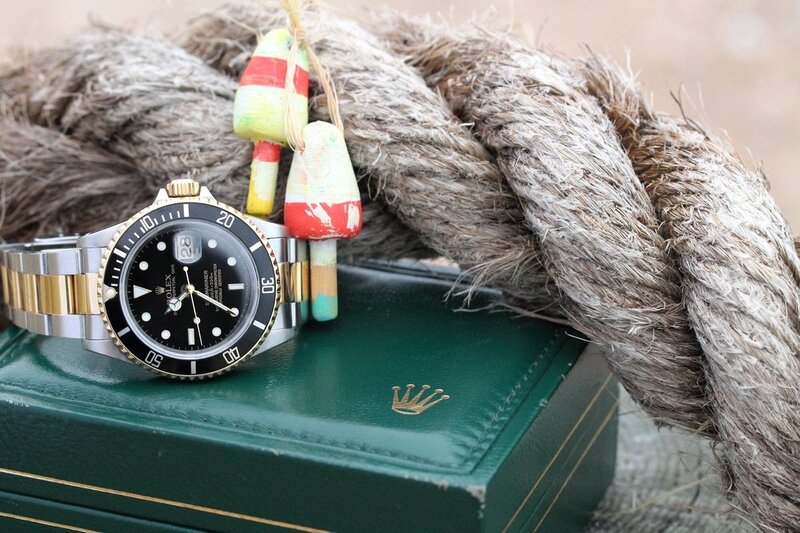 Back then, the Two-Tone Sub was in competition with an Omega De Ville - the Submariner won-out. But before the purchase was finalized, the salesperson suggested Bill seriously consider taking a blue dial version instead of the black. Bill appreciated the advice, but felt the blue dial would suffer the fate of most fads and end up being a poor investment. ...began picking my brain about what I thought his Sub was worth." Fast forward to present day: I’ve had the pleasure of knowing Bill for just over a year. We met at my job when I noticed his IWC Pilot’s Watch Chrono and struck up a conversation. During our initial business dealings our talks always steered toward watches. We covered all the usual topics: our modest collections, what to buy next, etc. At one point I mentioned to Bill that I sometimes attended watch shows, knew a few dealers, and occasionally flipped watches. Hearing this, Bill brought up a Two-Tone Sub he owned, but didn’t wear much nowadays. He felt I had a pulse on the market and began picking my brain about what I thought his Sub was worth. Before quoting a figure I needed to know more about his Sub. Turns out Bill not only maintained it in immaculate condition, but even kept the original box and guarantee certificate - a definite plus when it comes to reselling with hopes for top-dollar. However, there were two things he told me that made me hesitant to estimate a max-price. One potential issue was the original dial had been replaced during a servicing years ago because the hands and hour markers didn’t ‘glow’ anymore. I also had to tell him that the blue dial he predicted to become unpopular was actually preferred by buyers. In addition to trying my hand at appraising his Sub, I wanted him to consider restoring the dial and keeping it. After all, this was his first nice watch. However, it soon became apparent that it wasn’t the lack of an original dial that kept Bill from proudly wearing his Sub in equal rotation with his other watches (the aforementioned IWC Pilot’s Watch Chrono and an IWC Portuguese Chrono). It was more a matter of his style having changed over the years: The Two-Tone look didn’t quite suit his personality like it used to. Even so, not wearing it wasn’t reason enough to let it go. I could sense it would be a tough decision to say goodbye as he reminisced about wearing it on his wedding day, among other special experiences. ...not wearing it wasn’t reason enough to let it go." One thing I gathered from Bill - he wasn’t letting it go without a fight - he valued his Sub sentimentally, but also had an expectation of what it was worth financially. To support my valuation, I offered to take some photos and email a few respected dealers to gauge interest. After this, it would be up to him if the offers were compelling enough to part ways. The dealers got back to us with fair and strong offers. The swapped-out dial turned out to be a non-issue. And as expected, during negotiations, potential buyers admitted they would have upped their offer had his Sub been the more-demanded blue dial version. After some more heartfelt talks between us and undoubtedly some personal reflection, Bill sent me a text that said: “Ok, I’ve made my decision. Sell it! !” About a week later, after the deal was done, I asked Bill how he felt; I wanted to make sure he was comfortable with his decision. 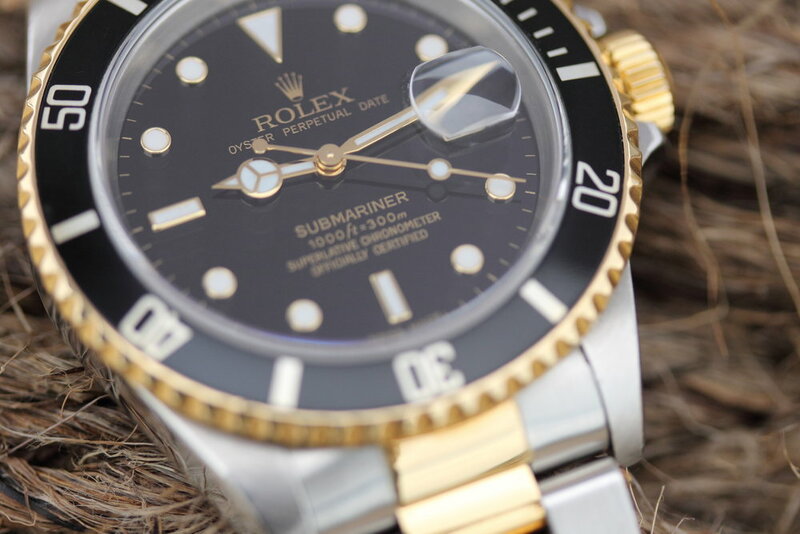 He found solace knowing that the memory of his Sub would live on in the next watch he buys: Whenever someone compliments his next watch, he’ll relive the story of his old Sub and talk about how it helped pave the way for the new one.